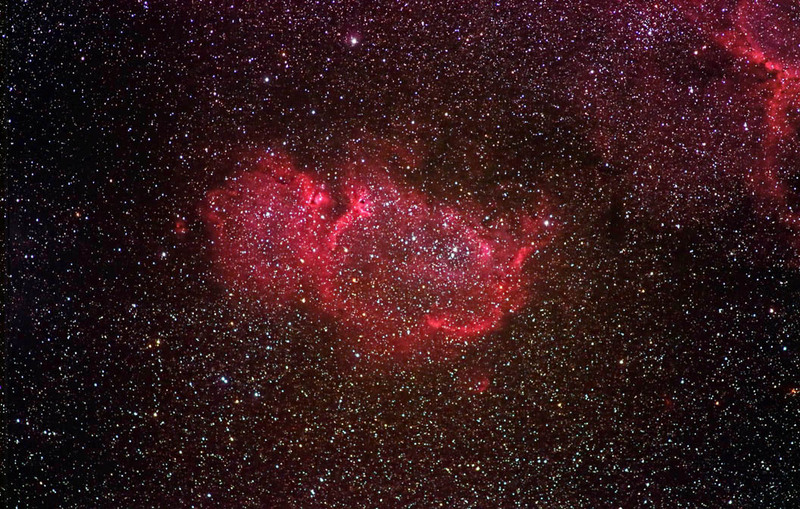 IC 1848 is often referred to as the Soul Nebula. This is due to its proximity to the Heart Nebula (IC 1805), which is partially visible at the upper right of the frame. Due to its shape, this star-forming region in Casseopiea is also known as the Fetus Nebula. It contains several open star clusters. Color: 24 @ 5 min. Luminance: 27 @ 5 min. Images were focused using the camera's live view. They were calibrated, aligned, and combined in ImagesPlus. Luminance image was obtained using a Kenko R-64 filter. The color and luminance images were aligned in Registar. The combined image was created and adjusted in Photoshop. Topaz Detail and DeNoise were applied. Taken from my back yard on 11/2/15 and 11/3/15.